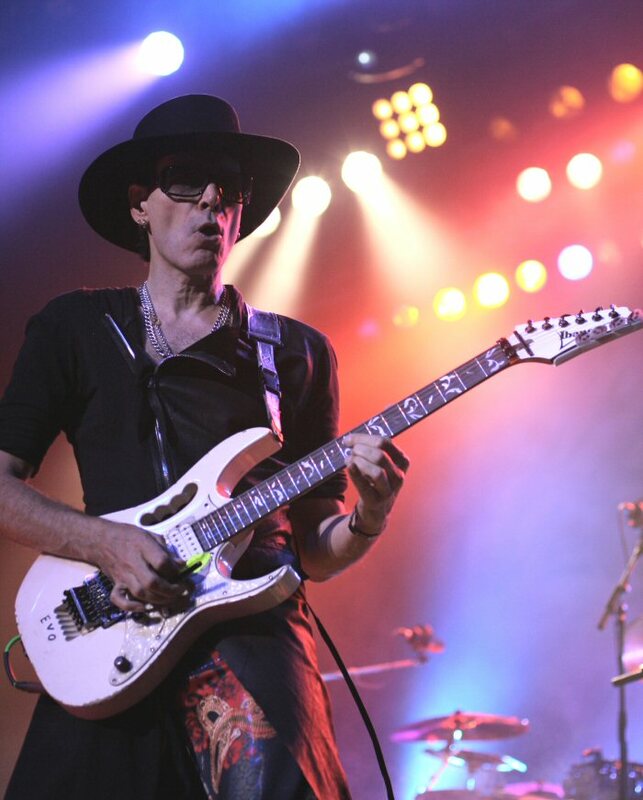 Virtuoso and visionary are just some of the words that have been used to describe Steve Vai the guitarist, producer and songwriter. Since 1984 with the release of his solo album Flex-Able Steve has strived to create sounds that are uniquely his own and often un-worldly. Vai is the type of player who crafts music to challenge boundaries and himself. With that goal he has sold millions of records and has won three Grammys along the way. 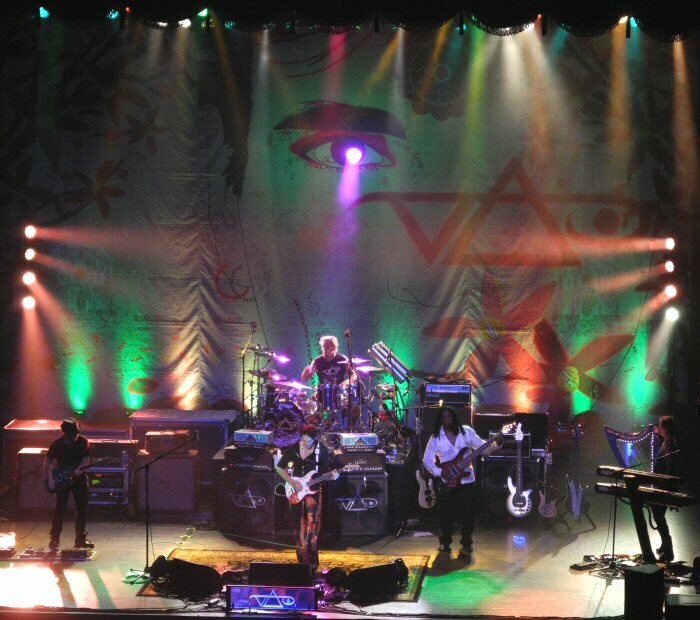 The Steve Vai Band at the Mayo Arts Center in 2012. Influenced by Led Zeppelin and progressive-rock, Vai favors conceptual ideas and his albums often revolve around a theme. One of his most ambitious projects was the making of Alive in the Ultra World (2001). The two-disk live set was recorded during a 32-county world tour with songs reflecting indigenous music from each nation. In 2012, Steve released The Story of Light. The 12-track CD continues the cosmic narrative that originated on Vai's acclaimed 2005 album Real Illusions: Reflections. Steve is also a bee keeper, vegetarian and founder of the "Make a Noise Foundation" which provides musical education and instruments for those who otherwise could not afford it. Despite winning many well-deserved accolades and awards, Steve is still searching for new challenges in composing and guitar playing. He continues to tour regularly and will spend much of the second half of 2012 on the road in the States and in Europe. Soundpress.net had the pleasure of experiencing the King Bee of the guitar at the Mayo Performing Arts Center (MPAC) in Morristown, New Jersey on September 8th, 2012. 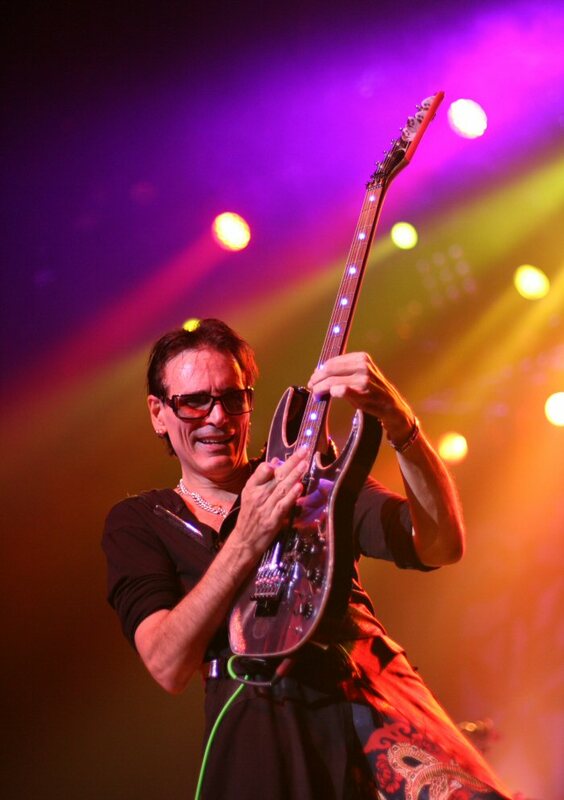 The theater has enjoyed many up-grades with more coming and is a premium venue for high caliber acts such as Steve Vai. Steve came out blazing with flashy attire and performance. Behind the stage filled with gear was a backdrop with an all seeing eye that had a light that beamed out into the audience as Steve and his band came out. There was a second eye next to two triangles and it took us some time to realize that the symbol spelt Vai. The group came out at full force on the first instrumental playing power packed riffs and rhythms in time to the flashing lights. The second instrumental progressed at warp speed with Steve crafting almost siren like notes from his guitar punctuated by bold bass lines from Philip Bynoe. Vai's solo shimmered with a blend of long notes, whammy bar and treble effects. Throughout the show, Steve used a swarm of techniques to craft singular and often supernatural sounds. "Nice to be here on tour with this band in this beautiful venue," greeted Steve as he segued into group introductions. The band continued expansive jams with Steve playing his multiple of guitars from various angles to add more dynamic accents to the mixes. Vai made a point of working the whole stage playing to all sides and sometimes doing a few dance steps as he dominated his instrument. 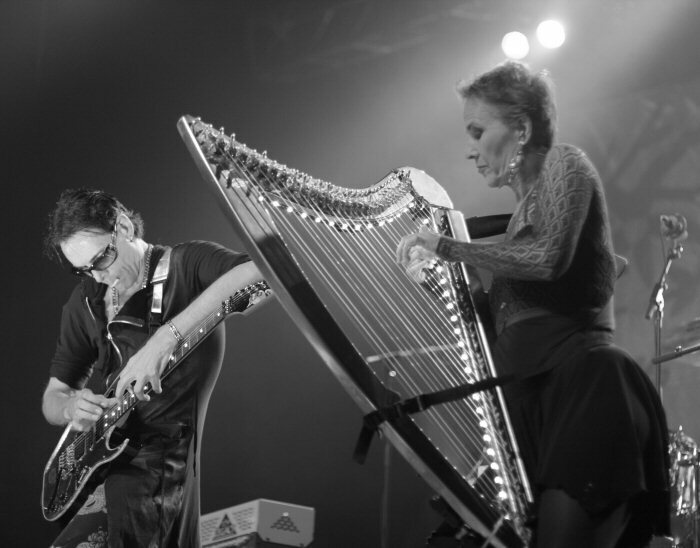 The show featured a lot of interplay between Vai and Deborah Henson-Conant on electric harp. The concert also included solos from the band. The first was from guitarist Dave Wiener who played an acoustic number with layered leads and rhythm. Steve and the rest of the band returned to the stage and performed "Weeping China Doll" from The Story of Light. The tune had a dark feel enhanced by a daunting beats and dramatic guitar leads coming from a fret board that was lit up. The electric harp played by Deborah Henson-Conant floated to the top of the mix adding interesting effects and elements to the song. The band performed another new track and invited opener Vicci Martinez to sing. Their version of "John The Revelator" was roaring and Vicci rose to the occasion with her powerhouse vocals. Building on that energy the band continued to blaze on complex instrumentals with Steve beguiling the audience with an array of techniques and tricks. Deborah took center stage sharing a quick overview of the harp before performing a song from her Invention & Alchemy album. Her solo sparkled as Philip Bynoe backed her on stand up bass. The piece showcased a blend of plucking and speedy strumming that was layered by using loops. Steve joined the two and his acoustic playing was melodic and multifaceted. Next was the comic element of the show as drummer Jeremy Colson came out with a strap-on drum and skull contraption. The two joked about strap-ons and Billy Idol who Colson has toured with. Their musical exchange was playful before the rest of the band joined in melting into a piece that had a world vibe that was whimsical. The drum part on the contraption was captivating with its pulsing beats and lights. Jeremy then moved back to his kit for a dynamic drum solo. Vai told the story of light with the help of this illuminated guitar. Steve returned to the stage in a helmet and suit of lights playing an odd shaped guitar that was luminous. At this point, Vai's leads were alien yet articulate. The fog and smoke added to the out of this world effect. The band blazed on their jam allowing time for Steve to switch clothes before soaring on another guitar solo. Improvisation was another element in Vai's multipart concert. Steve invited Eddie Trunk (That Metal Show) and some members of the heavy metal band Sevendust to join him on stage. Eddie was enlisted to help Steve write a song on the spot. Trunk had to come up with the sounds and the musicians played it. Vai added some enhancements and the end result was a tune with a funky groove. The show ran the gamut from acoustic, hard rocking, humorous and spontaneous. The concert into the encore remained vigorous and vivid. Steve's playing and presentation were vibrant to the very last note and Sondpress.net left the theater with a Vai high. 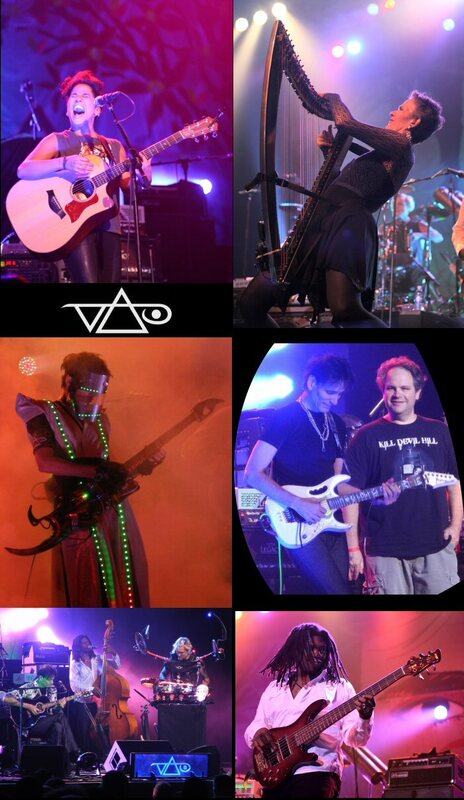 Steve Vai was the master of ceremonies for the varied 2.5 hour show. Opening for Steve Vai was Vicci Martinez. Vicci played an acoustic and sang originals along with a cover of Dolly Parton's "Jolene". In between songs, Martinez chatted and mentioned that she had been a contestant on The Voice. Vicci was a strong singer and was apt on the acoustic. Her songs were insightful with catchy hooks that were enhanced by her expressive vocals. Martinez was well received and as mentioned she was potent performing with Steve Vai. 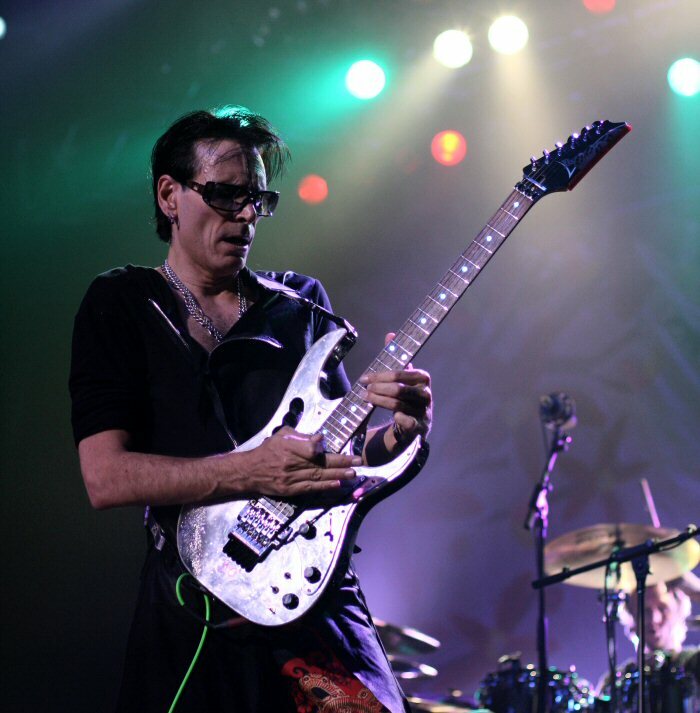 Steve Vai was yet another impressive show at The Mayo Performing Arts Center (MPAC). The MPAC showcases a wide range of artists. The venue is located in the heart of the Morristown which has plenty of cafes, history and shops to explore. Upcoming performers at theater includes Earth, Wind & Fire, the NJ Symphony Orchestra, Jars of Clay, Paula Poundstone, Glen Campbell, Fountains of Wayne, Chris Botti and a number of holiday themed shows such as the classic Nutcracker. Please visit http://mayoarts.org for a complete list of events. Eddie Trunk helps write a song; Jeremy Colson with his portable drum kit; and, Philip Bynoe on bass.